Evoke classic style and elegance with this 3/4 sleeve color block dress. 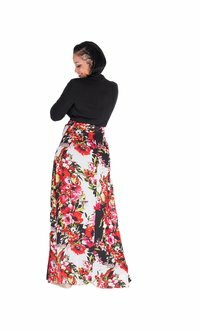 The dress features a deep v-neckline, 3/4 sleeves with a fitted waist that flows into a gorgeous full-length floral print skirt. The skirt of the dress is A-line silhouette with a matching printed sash, inverted pleats with an ankle length finish. Pair this dress with accessories from our collection for an even more glamorous finish.